Please welcome the 2 newest chapters to the Spyder Ryder of America family. Our 30th Chapter: The Ladies Eastern National Chapter will serve our Lady ryders in the Eastern US from a base in the Washington DC area. Our 31st Chapter: The Riverside County Chapter will serve ryders in the Riverside California area. Please visit these chapter online and welcome them to the family, we are proud to have them aboard. Spyder Ryder of America is pleased to announce our 29th chapter, The Four Corners Chapter is the newest addition to the SRA family. Please be sure to drop by their Facebook page and welcome them aboard. Spyder Ryder of America is pleased to announce our 28th chapter, The Big Sky Montana Chapter is the newest addition to the SRA family. Please be sure to drop by their Facebook page and welcome them aboard. Please welcome our 2 newest chapters, The Superstitions Chapter (Phoenix, AZ) and The Great Salt Lake Chapter (Salt Lake City, UT) this brings our total coast to coast to 27 Chapters. 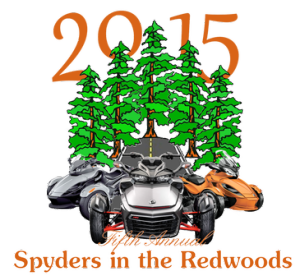 Registration is now open for the 5th Annual Spyders in the Redwoods event!! Spyders in the Redwoods was selected by BRP as one of seven BRP-sponsored Can-Am Spyder Owner’s Events in the U.S. and Canada for 2015. We are so very grateful and appreciate all of the support we have had over the years. You can register for the 2015 event from March 15th until July 18th (11:59 PM PDT). Please visit the Registration Page to complete your registration. After that, do not forget to check our Lodging Page for lodging information and host hotel / venue information. Also, please check out our Sponsor / Vendor Page to see who you can expect to see at this year’s event. Vendors, please go to the Vendor Registration page to complete your registration. Please contact them at spydersintheredwoods@gmail.com with any questions.